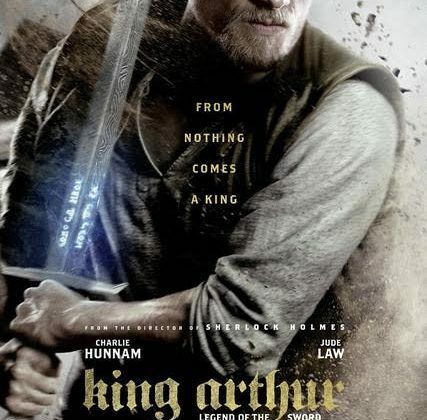 I once a saw a movie about the story of King Arthur in theaters. But it was done more from a historical aspect and I didn't really like it. The latest one is a mystical take on the whole story in connection with the sword in the stone. Ironically, there is an actress in the film who played a character in a prequel TV series of the story that I used to watch. They keep some of the same characters connected to the story of King Arthur that everybody knows about. There is a woman that is a mage that is in the Merlin’s place in the story. Arthur is the son of Uther which is part of the story of King Arthur. The Lady of the Lake is present and she in fact returns the sword to Arthur's hands at one point after he throws it away. The Story begins when his jealous uncle takes Camelot from Uther played by Eric Bana. His father tries to get Arthur and his wife to safety. But that doesn't happen. His father ends up in a sword fight with his uncle to make it so Arthur is able to escape. The man is raised by women in a brothel. He becomes a survivor. But that doesn't mean he doesn't have any morals. This man is loyal to these women from the brothel and I believe the friends that make up his crew. Perhaps very fortunately, he has learned to fight and handle a sword from a friend who is skilled in that area. Fortunately, because that is what a king would need to know how to do. But then his destiny comes calling and he and the sword are together. Along with his uncle who's played by Jude Law coming after him. He doesn't really want this fate at first. He can't even control the sword's power. But goes on sort of a vision quest to learn to control it. Which does work for him somewhat and gives answers to a vision that he had most of his life. He, his ragtag crew and the resistance against his uncle come up with a plan to strategically take care of the tower that will be able to make his uncle be very powerful magically when it is finished. They also try to kill him, but that doesn't work. They attack the castle and they manage to take the castle. A final battle between him and his uncle happens there. But while he does have control over the sword somewhat. He has not mastered the sword. The sword fight is going on between him and his uncle and his uncle has his magic on his side. Then let's just say Arthur is given a blessing from his father that helps him master the sword. I really liked the movie. I liked it much better than the last one I mentioned that I saw which pretty much is the story of King Arthur. It was action-pack and had an offbeat to it that was fun to watch. I am going to go see the movie again in theaters.